A model of a Sauropod eating prehistoric plants—soon to become farts. The news has been full of cows “releasing” methane that contribute to global warming. But could dinosaurs have contributed to global warming in the same way? Researchers in Liverpool John Moores University (LJMU) in the United Kingdom believe that they did. The basis of their research is that the largest dinosaurs ate enormous quantities of plants and in order to digest them they must have employed microbes to help. Cows use the same type of microbes to make the plants they eat more digestible. In cows these microbes produce large amounts of methane as a byproduct. 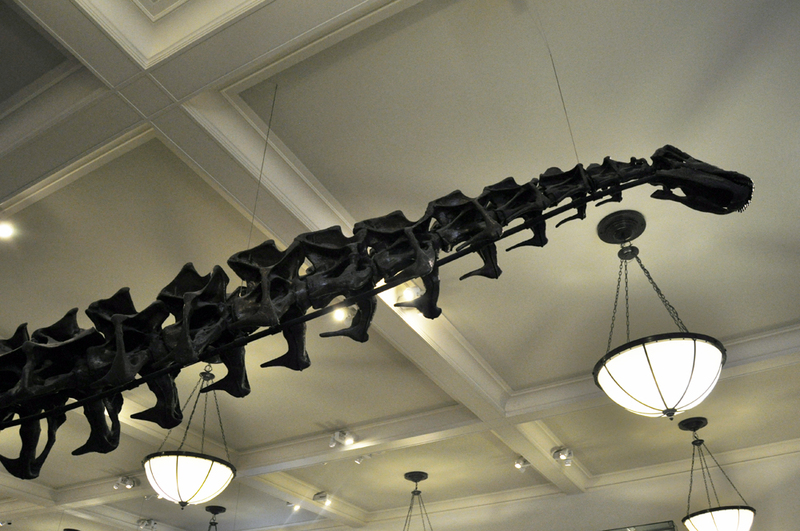 The research done by LJMU focused on Sauropods (long neck dinosaurs like Diplodocus, Apatosaurus, and Brachiosaurus). They found that these dinosaurs likely added 10 times as much methane to the atmosphere as cows do today. And because methane contributes to the greenhouse effect more than 20 times stronger than carbon dioxide, that is a significant amount. Although LJMU points out that “previous studies have suggested that the Earth was up to 10C (18F) warmer in the Mesozoic Era,” this is unlikely all due to dinosaur farts.